The school holidays are upon us, and whilst we adore the extra time we get to spend with the little people in our lives, we also know it is totally exhausting too. So here I am with a reminder to take a little you time in amongst the chaos. I think there is no better way to do this than with a relaxing bath, a fabulous candle and a well deserved glass of wine. The Polly and Me candle range is the perfect addition to this set up, so let me tell you a little more about them. I think there is just something really warm and inviting about a room with a flickering candle in it. Using candles within your home can create an intimate, relaxing atmosphere as well as leaving the house smelling divine. As well as the scent, decorating your home with candles can really transform the aesthetic and can add that extra loving touch to a room. These are the reasons behind my decision to launch a range of Polly and Me candles that both smelt amazing but looked the part too. I have a range of beautiful candles that can also be personalised too which make a lovely thoughtful gift for a loved one or can be purchased as a lovely treat for yourself. Our luxury, stylish candle comes in a choice of three fragrances as well as the option of your own wording designed in modern calligraphy. Each beautifully designed jar is filled with eco friendly soy wax centred around a wooden wick. 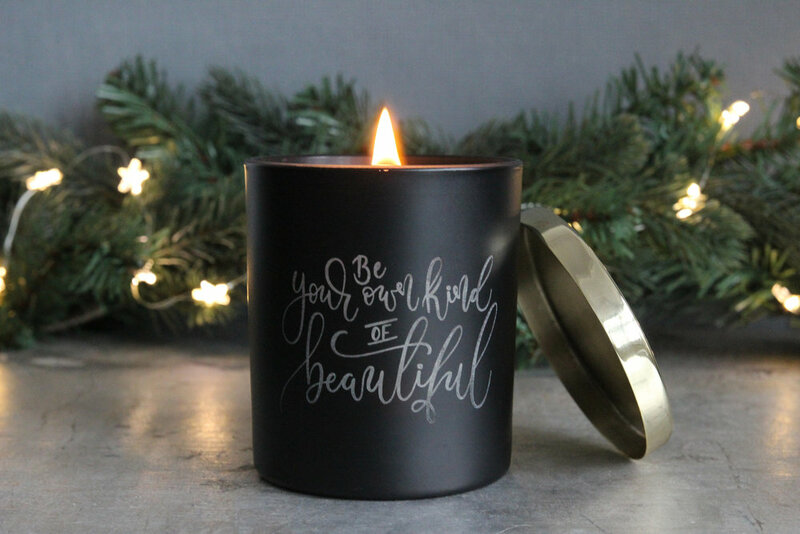 Not only do the black and gold look stunning, they smell truly divine and and the wooden wick makes a peaceful crackling sound as it burns, perfect for a romantic night in. The three fragrances to choose from are Lime Basil and Mandarin, Pomegranate and Gingerbread. Similar to our black and gold wooden wick candle, our white and copper candle stands beautifully in the home and is wonderfully scented. Again the three fragrances to choose from are Lime Basil and Mandarin, Pomegranate and Gingerbread. Our modern calligraphy candle comes in a choice of two fragrances and you can choose from four modern calligraphy designs. The two fragrances to choose from are Lime, Basic and Mandarin or Honeysuckle and Jasmine. The four choices of phrases are ‘Be you’, ‘Be kind’, ‘Lets stay home’ and ‘Our happy place’. All the phrases are beautiful and make a unique décor for the home. Each of our candles come presented in a Polly and Me HOME branded white box – making it the perfect gift for a loved one or a special treat for yourself. To shop our full HOME range using the link below.